My whole life I've avoided salt. 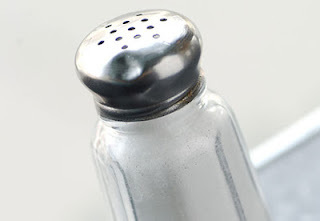 My mother didn't cook with a lot of salt when I was growing up, and my taste buds never required that flavor. I did Bikram yoga four days in a row, and by the fourth day I had to sit out most of the class. Something was wrong with my body. The yoga studio owner said that I must not be replacing the minerals in my body. When you sweat as much as we do in Bikram the studio owner said it's important to supplement your diet. One thing he had me do was add a spoonful of sea salt to a glass of water and drink it. I did. It was gross. However, my body bounced back. I was cured. Who knew salt was so important? If you eat a lot of salt, then start doing Bikram and it'll flush it all out of your system. If you don't eat a lot of salt, like me, and you do Bikram yoga, then you'll have to eat more salt.